Proctor is pure neighborhood charm. 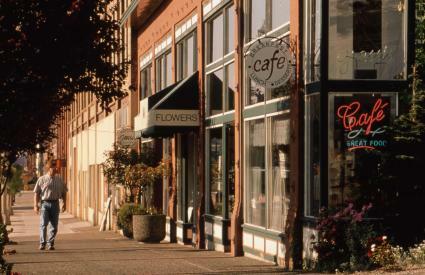 Its tree-lined residential streets are centered around a small retail core where storefronts offer locally made and hand-crafted goods; trendy boutiques and consignment shops showcase inspired fashions; small family-owned restaurants welcome you with local fare; and the quirky Blue Mouse Theater shows second-run, classic and indie films for just $4. Make sure to stop by on Saturday, when the Proctor Farmer&apos;s Market is in full swing. Fresh produce, locally-sourced meats and seafood, fresh flowers and artisan food vendors show up every Saturday 9:00 a.m. - 2:00 p.m.
Catch a flick at the historic Blue Mouse movie theater (little known fact: the neon mice on the marquee are some of Dale Chihuly&apos;s first neon glass art pieces), or bowl a few old-school frames at Chalet Bowl. For good luck, visit Mason Plaza and shake the hand of the statue of “Tacoma’s Best Salesman” Allen C. Mason. Proctor is a place to shop like a local. You won&apos;t find many chain stores, so you’ll be supporting local mom-and-pop shops while filling your cart. Pick up a souvenir at The Pacific Northwest Shop or Compass Rose; support a local artist at Proctor Art Gallery; or peruse the stacks for a classic paperback at Culpepper Books. Find a new fashion at one of the boutiques (Envy, Walla Walla Clothing Company) and secondhand/consignment shops (Blue, Bloomington Kids, Megs & Mo Upscale Resale). Pick up a video at Backstage Video & Beer, a retro-style video store that doubles as a bottle shop for beers and wines. It’s not just the depth of Proctor’s restaurant scene that’s impressive, but the breadth of types of cuisine on offer. Viva Tacoma is a vegan’s dream, while Pomodoro is the family-run Italian restaurant that’s consistently topping the best-of lists, and Cooks Tavern is a recent addition from some well-known Seattle restaurateurs that has made itself the go-to spot for comfort food and cocktails. On the sweet side of things, Top Pot Doughnuts opened in 2017, bringing Seattle’s most recognized doughnut brand to the South Puget Sound. For craft beer, Peaks and Pints is the tap room/bottle shop everyone wishes was just across the street from their house, with constantly evolving tap and bottle lists filled to the top with local brews.